Fellow barbecue blogger Robert Moss recently told you about the largest barbecue in our nation’s history. 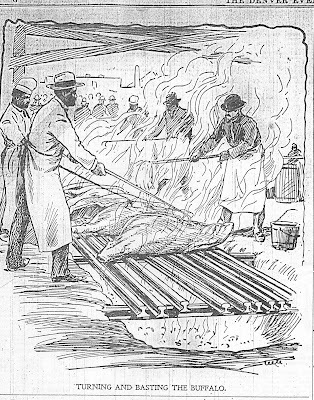 Now it’s time to hear about the wildest: “The Last Buffalo Barbecue,” held in Denver, Colorado, on January 27, 1898. A group of Denver’s prominent citizens wanted the city to be the permanent home of the National Stock Growers Convention, where the biggest cattlemen gathered to buy, trade, and talk all things livestock. The concerned citizens seduced the conventions organizers and VIPs with barbecue—a lot of it. On the gargantuan menu for the 20,000 expected guests were 2 buffalo, 10 cows, 4 elk, 30 sheep, 2 bears, 15 antelope, and 200 possums. For the vegetarians in the crowd (okay, there probably weren’t many of those), side dishes included 35 barrels of yams, 10,000 pickles, 3,000 loaves of bread, a half-ton of cheese, 300 kegs of beer, and 200 gallons of coffee. Due to the great anticipation for the event—and the aroma that wafted all through town—50,000 people showed up for the barbecue. And they were all hungry. As far as we know, they were right until 1923, when Oklahoma Governor Jack Walton’s inauguration barbecue boasted a similar menu and drew 125,000 attendees.